I’ve been invited by my colleague Shinichi Furuya (Computer Science Laboratory) to give a keynote lecture at the IEEE VR 2019 Workshop on Human Augmentation and Its Applications that will take place in March in Osaka (Japan). 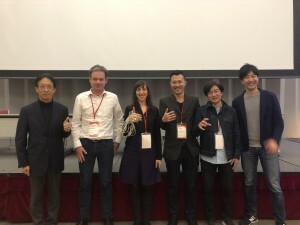 Here together with the organisers and other speakers, while I try an amazing exoskeleton developped at Sony CSL! During this past winter break 2018-2019, I had the opportunity to engage with the public in my hometown Madrid and talk about my research. I went to the studios of the Spanish Radio and Television Corporation (Radio Clásica – RTVE.es) to contribute to their programme Wavelength (Longitud de Onda) again as expert in Music and Neuroscience. I also had a fantastic time talking about our work on brain-body interactions during music performance as an invited speaker for the Neuroencounters at the Nirakara Institute (Centre for Cognitive Science) in Madrid. Check out their youtube channel for an upcoming broadcast of my talk. 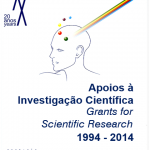 My colleague and collaborator, Marinella Cappelletti, and I were awarded a Grant for Scientific Research from the Bial Foundation to work on brain and cognition across the life span. We will be hiring soon a couple of new lab members. We are developping new collaborations with industry partners for our MSc in Computational Cognitive Neuroscience at Goldsmiths. Some of the confirmed partners are Sony Computer Science Laboratory and Bayer AG. I am going to join the Centre for Cognition and Decision Making at the Higher University of Economics, Moscow, Russia, as a Research Leader Fellow (part time position in addition to my main position at Goldsmiths). There I will mainly supervise new exciting MEG projects. In addition, together with my colleague Max Garagnani from the Computing Department at Goldsmiths, we are launching the new MSc in Computational Cognitive Neuroscience at Goldsmiths. Between March and August 2018 I am a visiting scientist at the Max Planck Institute for Human Cognitive and Brain Sciences in Leipzig (Germany). I will be working with different researchers, hosted by my long-term collaborator Dr. Vadim Nikulin. Among other upcoming talks for 2018, I am particularly happy to have been invited by the Mind, Brain and Body Institute in Berlin to give a workshop at their upcoming 6th MindBrainBody Symposium 2018. Berlin (Germany). 15-16.03.2018. I was invited to give a talk on 5th November as part of the Workshop “Active and passive methods of the brain research” at the Centre for Cognition and Decision Making of the National Research University Higher School of Economics in Moscow (Russia). Music Performance in Madrid (Spain). 05-07.10.17. I was invited to give a workshop on neuroscience and Musical Instrument Digital Interfaces(MIDI) at the Sysmus17 – 10th International Conference, organised by Queen Mary University, London (UK). 13-15-09.17. In July 2017 the radio programme (Longitud de Onda) (Wavelength) of the Spanish Radio and Television Corporation (Radio Clásica – RTVE.es), which I contribute to, received a special commendation award in the category “Scientific Public Awareness” by “Ciencia en Acción”. From 27 April 2016 I am collaborating with the Spanish Radio and Television Corporation (Radio Clásica – RTVE.es) to contribute to their programme Wavelength (Longitud de Onda) as expert in Music and Neuroscience. In addition to presenting topics related to Music and Neuroscience, I select some of the musical pieces to be played during my contribution. You can tune in and listen every second Thursday of each month between 11:00 and 12:00 (Spain time: GMT+2). I co-organised with Dr. Boris Kleber the “International Symposium on Music Performance: Art and Neuroscience in Dialogue“, which took place between 29 April and 1 May 2016 in Tübingen. Funded by the Werner Reichardt Centre for Integrative Neuroscience, the Schering Stiftung and the International Brain and Research Organisation.